Mabel Leong, 87, of Honolulu passed away on Father’s Day, June 17, 2018, surrounded by her family. She is now in heaven with her husband, Rodney, giving him the best Father’s Day gift of enjoying each other’s company once again. Mabel was born on June 4, 1931, in Honolulu, the sixth among ten siblings. As the matriarch of our family, she generously gave to philanthropic causes, and was a devoted leader in her profession, retiring from Finance Factors as Vice President of Administration and Corporate Treasurer after 45 years of service. She is survived by her two sons, Rodney Jr., and Randy (Judie), grandson Jacob with whom she adored and shared many loving moments, and her youngest brother, Raymond (Betty) Mow. Visitation will be at 9:30 am on Saturday July 14th at Nuuanu Memorial Park and Mortuary, Chapel of the Flowers. Services will be held at 10:30 am with a burial to follow at 12:45 pm. Aloha attire. 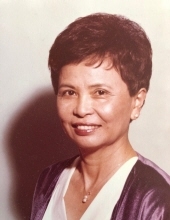 To send flowers or a remembrance gift to the family of MABEL M. LEONG, please visit our Tribute Store. "Email Address" would like to share the life celebration of MABEL M. LEONG. Click on the "link" to go to share a favorite memory or leave a condolence message for the family.